Heat 2 tablespoons of olive oil in a large sauté pan over medium heat. Add the onion, potatoes, peppers, and sausage and cook until the potatoes are golden, about 6-7 minutes. Transfer the mixture to a bowl. In a small bowl, whisk together the eggs and the milk. Heat the remaining tablespoon of olive oil in a large saute pan over high heat. Add the eggs and cook, stirring constantly, until set, about 2 minutes. Place about 2 tablespoons of the egg on each tortilla and top with an equal amount of the potato, sausage and pepper, and onion mixture. 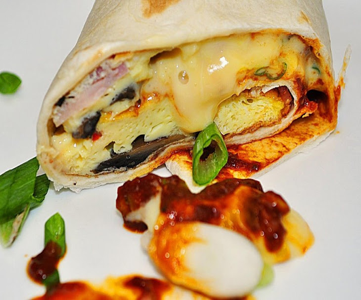 Divide the cheese between each tortilla, top with salsa and fold into a burrito, and serve immediately.